Congratulations to our columnist Doug Kass, who celebrated his 70th birthday on Monday. Kass, president of the Seabreeze Partners Management hedge fund, writes the real-time market blog Doug's Daily Diary every trading day for Real Money Pro, our premium site for active investors and market professionals. "I am all about better investing, and Doug Kass always challenges your thinking -- always tests your conviction," TheStreet's founder Jim Cramer said. "He raises the bar for anyone trying to figure out if a stock is right or wrong for the moment. Doug's column is a vital part of my day and has been for years. Congratulations Dougie for being a great guy!" Kass has written for TheStreet and its premium sites since 1998. A 1972 graduate of the University of Pennsylvania's Wharton School, he started his career as one of activist Ralph Nader's "Nader's Raiders," helping to write Nader's famous 1973 expose on Citibank. Kass later went on to hold senior positions at Omega Advisors, First Albany Corp., JW Charles/CSG, Glickenhaus & Co., Putnam Management and Kidder Peabody. Now, he runs Seabreeze Partners while analyzing markets in real time every trading day for Real Money Pro. Through Doug's Daily Diary, Kass gives traders and investors a peek behind the curtain at what data he's looking at and reveals what stocks he's buying, selling or shorting at that moment. He also runs a live chat for Real Money Pro subscribers in which readers can ask Kass or each other market questions or share their latest investment ideas. 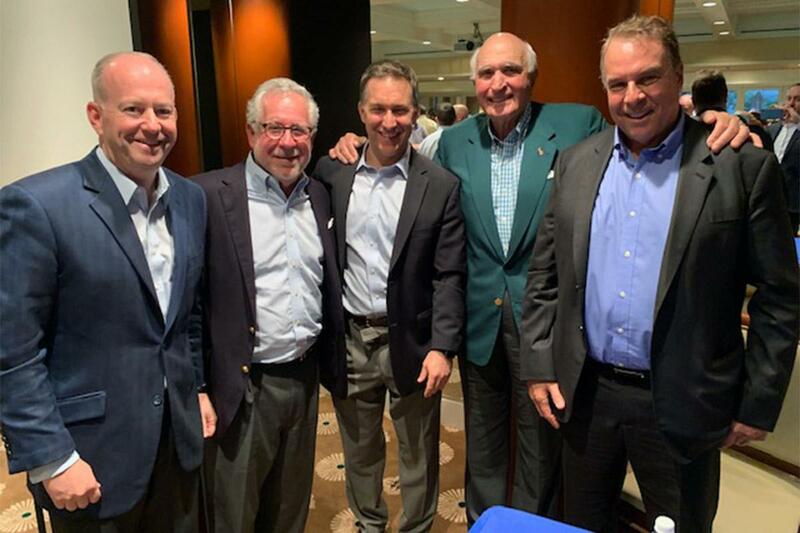 Kass, second from left, recently hosted a forum with top business and political leaders, including former U.S. Sen. George Lemieux (R-Fla.), left, and mega-financier Ken Langone, second from right. "As I pass a big milestone and celebrate my birthday today, I recognize more and more the passage of time," Kass wrote in a column Monday marking his big day. "Yet as it relates to my diary on Real Money Pro, oddly, I find myself working harder than I did two decades, 10 years, a year ago and a month ago. ... The most amazing thing to me is that the investment mosaic is ever more complicated -- providing a flow of ample and fertile material for analysis and interpretation. "Markets are more interconnected and dynamic than at any time in history," he wrote. "As I see it, investment time is a sort of river of passing events (earnings reports, business developments, management changes, etc.) -- and strong is its current. No sooner is a thing brought to sight than it is swept by and another takes its place, and this, too, will be swept away." Sometimes called the "Bear of Boca," Kass is well-known for both bullish and bearish contrarian calls. Two recent calls that have worked out well so far are a December recommendation to buy Goldman Sachs (GS - Get Report) and a November suggestion to purchase Facebook (FB - Get Report) . Kass recommended FB on Nov. 29 at $137.59, and the stock has rallied some 20% since then to about $165.50. With Goldman, Kass actually had two big wins on the name over the past year. First, he recommended shorting GS at about $242 in January 2017 -- a call that proved prescient, as the name fell nearly 30% by the time Kass suggested closing out the short at $170 on Dec. 17. Kass then moved Goldman from his "Best Short Ideas" list to his "Best Long Ideas" list on Dec. 17, which also turned out to be a good call. Since that date, GS has added some 14% to about $191.50. Click here to learn more about subscribing to Doug's Daily Diary on Real Money Pro.